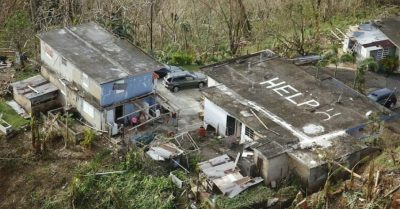 The government of Puerto Rico Tuesday raised its estimate of the number of Puerto Ricans who lost their lives to 2017’s Hurricane Maria from 64 to 2,975. This figure makes Maria the worst natural catastrophe on territory claimed by the US since the Galveston, Texas flood of 1900. The near 50-fold increase in the death toll exposed what millions on the island already knew: that the authorities had long deliberately concealed the real human cost of the storm. It is also a searing indictment of the criminal negligence and indifference of both the US ruling establishment and its two major parties, as well as that of the territory’s own governmental authorities. Governor Ricardo Rosselló officially adopted the new figure for the number of Hurricane Maria’s victims following the release of a study commissioned by his government and carried out by George Washington University’s Milken Institute School of Public Health. The study appears to be the most scientifically rigorous and detailed thus far, drawing on demographic data that the Puerto Rican government had previously hidden from the public. It compared the death rates between September 2017 and February 2018 to earlier periods dating back to 2010. The researchers also factored in the mass exodus of people fleeing the desperate conditions prevailing in Puerto Rico, marked by interminable power outages, for the US mainland. During this period, Puerto Rico’s population fell by 280,000, an 8 percent drop, making the increased number of deaths all the more extraordinary. Earlier studies had already provided far higher numbers than the ludicrously low death toll maintained by the Puerto Rican government for nearly a year. Research done by Penn State based on death certificates had come up with an estimate of 1,139 deaths. Another study done by Harvard University, based on interviews with a random sample of some 3,300 households, yielded an estimate ranging between roughly 800 and 8,500, with a median figure of 4,645. This number was embraced by many Puerto Ricans who were outraged by the deliberate underestimate maintained by the Puerto Rican and US governments. The Harvard researchers noted that this median figure was likely too low, and that the real number of deaths was probably higher than 5,000. No doubt the George Washington study also represents a serious underestimation of the real number of fatalities. Among the more important findings of the George Washington study was the vastly disproportionate impact of the storm in terms of deaths among the poorer layers of Puerto Rican society, compared to the wealthy and the middle class. It found that the risk of death was 45 percent higher, and remained so until the end of the study’s period in mid-February, among populations referred to by researchers as “low socioeconomic development municipalities.” For poorer inhabitants of the island generally, the chance of death was 60 percent higher. A graph included in the study shows that, while the death toll increased among all layers of the population between September and October 2017, it rose far more sharply for the poorer layers of the population and continued to increase between October 2017 and February 2018, even as it leveled off for wealthier social layers. The finding only confirms that Maria, like all natural disasters, served to lay bare the conditions of poverty, social crisis and inequality that existed before the storm ever made land. The study also found that men over the age of 65 continued to confront a higher rate of deaths through the end of the survey period. The George Washington researchers warned that, had the study continued, it would almost inevitably have tracked a continuing elevated death rate for these layers of the population, particularly given the protracted conditions of deprivation on the island, with a lack of electricity continuing for some until only weeks ago. A proposed second phase of the George Washington study would aim at recording the names of those who died and providing in each case a cause of death, based on an examination of death certificates as well as interviews with families and medical personnel. The Puerto Rican government has yet to fund this stage of the inquiry. The Trump administration responded to the latest death toll estimate with its inevitable brutish callousness. At a White House meeting Tuesday, Trump praised his administration for doing a “fantastic job” in Puerto Rico, despite the incontrovertible evidence that thousands were left to die because of its criminal negligence and insufficient aid. The grotesque self-praise from the White House echoes the tone adopted by Trump when he staged a brief visit to Puerto Rico just two weeks after the storm, throwing paper towels to storm victims and congratulating the island’s governor and other officials for having avoided a “real catastrophe like [Hurricane] Katrina,” which claimed over 1,800 lives in New Orleans and on the Mississippi Gulf Coast. He repeated the official death toll of 16 being put out by authorities in San Juan at the time. At the time, millions of people were still digging out from the storm, and everyone knew that far more people had lost their lives. In addition to the widespread popular hatred for Trump and the US authorities, there is intense anger against Governor Rosselló and his local administration for failing to reveal the real scope of the tragedy inflicted upon the island’s population and to secure the resources needed to confront it. The reality is that the government in Puerto Rico, together with the Trump administration and both the Republicans and Democrats in Washington, has been focused—both before and after Maria struck the island—not on ameliorating conditions of poverty and social deprivation, but on extracting profits for Wall Street bondholders under conditions of the island’s fiscal bankruptcy. It is estimated that Puerto Rico, still confronting the protracted health emergency wrought by Maria, will pay $1.4 billion on debt restructuring over the next six years, an amount that significantly exceeds the entire budget of the island’s Health Department.